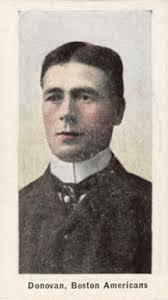 He played for St. Louis from 1900–1903, sharing the league lead in stolen bases (45) in his first season, also managing the team in his last three seasons with them. Leading the Cardinals to a surprising 76-64 record in 1901, hopes were high for the next year as Donovan won high marks for “treating his players honestly and fairly.” Then, all of the team’s best players – except Donovan – jumped to the new American League, signing with the cross-town Browns. Gutted by the defections, the Cardinals fell apart. In 1903, the team finished 43-94, 46 ½ games out of first place; and Donovan was jettisoned by the front office. Since he was pulling down an $8,800 salary that made him the game’s highest-paid player, the bosses found it an easy decision to make.